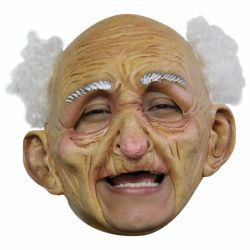 The chinless old man mask gives you the look of an old man but leaves your mouth open so that you can talk and make a wider range of facial expressions. Mask is one size fits all. For a more comfortable fit it is recommended that you wear a nylon hood underneath the mask.